This MS Excel Spreadsheet is actually detailed instruction for each procedure necessary for correct testing of power transformer. Very interesting !!!. 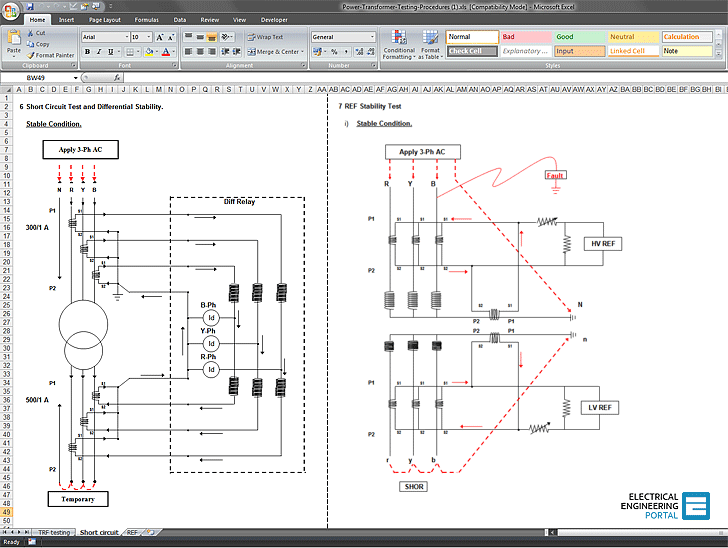 Thanks to send me this document on PDF. In frensh if it’s possible. Please share me about Temperature Indicators Calibration procedure for Transformer. why you are not include tan delta test for this artical. And also I need all vector group test include this artical. A concise, simple, easy and quite helpful artical on the subject. Thanks for helping the community. Really useful for testing engineers. When doing the REF test, to bypass the main winding impedence and take only CTs in picture, there’s a method..
any one can post, how to do the connection.. There is a problem on Box.com. We are working on this and will be solved within few hours. Please be patient. Thanks for understanding.